The Kiribathgoda branch opened by Chief Guest Prasantha Lal de Alwis. 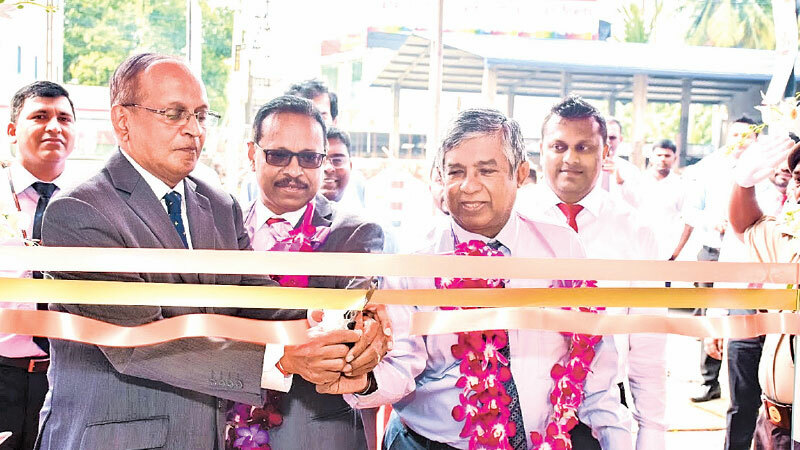 In a bid to extend their services to the entrepreneurs and the general public in the area, Siyapatha Finance PLC opened branch in Kiribathgoda recently. A fully-owned subsidiary of the Sampath Bank Group, Siyapatha Finance now progressed of a network of 27 branches in its islandwide network. The newly opened branch is located at Kandy Road Kiribathgoda and Prashantha Lal de Alwis, the Deputy Chairman of Siyapatha Finance, graced the opening ceremony as chief guest, along with Dr. Dilanjan Soysa, a member of the Director Board, Saman Herath, the Managing Director of Siyapatha Finance and other members of the organization’s management. “The success of Siyapatha Finance is deeply rooted in our customers. We have always worked hard to maintain a high standard of service while winning the trust of the customer. The growth of our network is primarily to ensure that the services of Siyapatha Finance are accessible to as many people as possible. Since Kiribathgoda area is having a high population density and is reported to be one of the fastest developing areas in the Western Province, we feel that the new branch is well placed in our objective to serve many Sri Lankans to uplift their living standards with our innovative financial solutions,” said Alwis, the Deputy Chairman of Siyapatha Finance. “Addition of the new branch - Kiribathgoda to our network, is a significant achievement for us, as it allows us to reach out to more customers in the prominent business and residential areas of Kiribathgoda. We, at Siyapatha Finance have always made sure to maintain a customer-centric approach in all our endeavors. Our primary concern is to ensure that our customers receive the very best of our services,” said Saman Herath, Managing Director of Siyapatha Finance PLC. As the largest fully owned subsidiary of the Sampath Bank Group, Siyapatha Finance PLC is one of the most prominent financial companies in Sri Lanka, with a network of branches throughout the country including north and east. Over the past thirteen years Siyapatha Finance PLC has generously contributed to the development of a number of entrepreneurial effort as well as the fulfillment of the financial needs of individuals across the island.